The palette knife is not just a tool for mixing paint on your palette. You can actually use the palette knife to create some pretty stunning effects in your paintings which are not possible with a brush. Some artists ignore the brush all together in favor of the palette knife. This is a detailed guide to help you get the most out of your palette knife for your paintings. It is so easy to clean a palette knife. You literally just need one wipe with a cloth or paper towel and all the paint is gone. This is a huge advantage over brushes, which require much more care. It can be cheap, depending on the quality of the palette knife. It is great for building up a thick texture and creating a broken color effect. You can use the edge of the palette knife to create sharp lines. The bold strokes created by the palette knife can complement the more delicate strokes created by the brush. You can paint on top of wet layers without having to worry about the paint blending (like it does with your brush). You are not able to paint with as much accuracy using a palette knife. It is not as versatile as a brush. A flexible but sturdy blade. You do not need any unusual shapes. 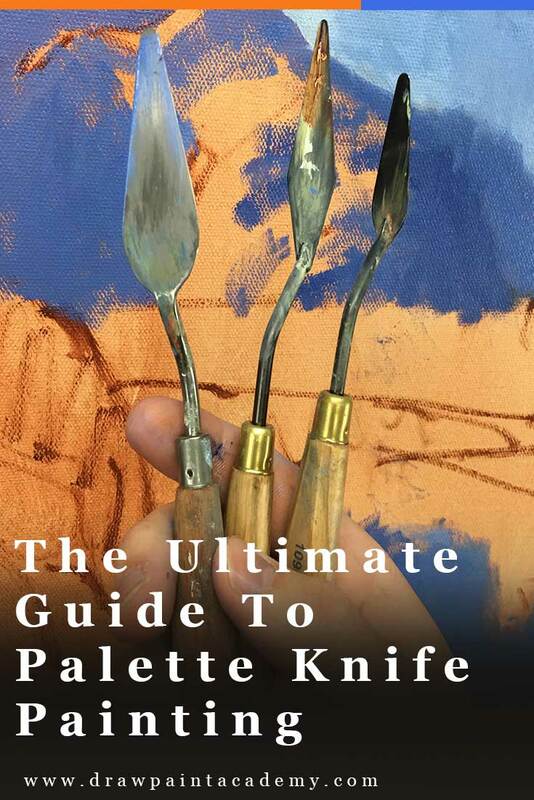 Just a standard-shaped palette knife in a few different sizes is more than enough. You can use the palette knife to create thin, usually broken lines which can look very natural in a painting. All you need to do is load the edge of the palette knife with a thin amount of paint and then dab the edge on the canvas. Just make sure the paint is evenly spread across the edge of the knife. Also, you will usually only get one line per stroke, so you will need to keep reloading your palette knife between strokes. You can see Colley Whisson using the palette knife in this video to paint the thin line of a fence. 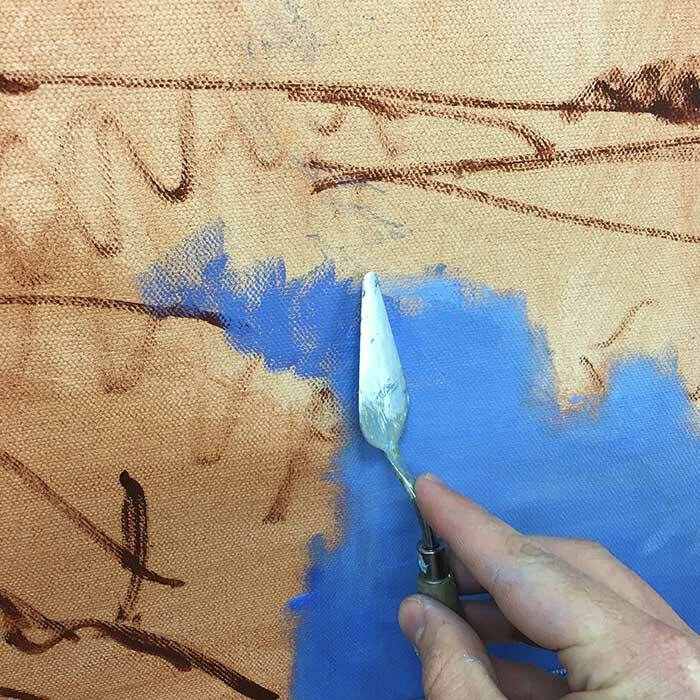 The palette knife can be fantastic for blending edges by dragging one color into another. What you are left with is a very rough and scattered edge. If you were to do this with a brush, you would get a much softer edge. This is where the palette knife really shines. You can quickly scrape away paint from the canvas to clear an area where you went wrong. You can also use the palette knife to scrape details into your painting. For example, you could scrape away a thin line of paint to imitate a tree branch. When doing this, you just need to be aware of what color will be exposed in the underpainting. Staining the canvas comes in handy here as you will get some nice earthy color exposed rather than just the glaring white of the bare canvas. This is one of my favorite techniques. Just take a few different colors and mix them together but not that well. Then take your palette knife and create a thick stroke of broken color. I usually prefer a brush for scumbling over an underpainting as I feel it gives me more control, however you can use the palette knife for this also. You can get some very interesting results by doing this with a palette knife. What this involves is dragging paint very loosely over an underpainting so that the paint breaks off onto the canvas. This can be useful for adding variance to water or grass. This technique involves loading the tip of the knife in thick paint (usually some kind of vivid color) and then dabbing it onto the painting. I use this technique in the later stages of a painting when I want to add a few small bursts of color. Below is a close-up of one of my paintings which demonstrates this technique. Notice the small bursts of vivid reds, blues and yellows on top of a dull foundation. This is great for creating a sense of activity, without actually having to render all the details. Because the palette knife allows you to paint layer on layer without having the paint blend together, you can achieve some beautiful broken color effects which are not possible with a brush. The Russian impressionists take advantage of this in many of their paintings. The result is a vibrant display of color which almost seems to vibrate. To paint the highlights on rocks. To paint snow on a mountain. To build up texture in the foreground to imitate the grass, rocks and other nature. To paint the leaves or bark on a tree. To quickly cover the canvas with paint. To paint lines for fences, tree branches or sharp edges. And of course, I use the palette knife to mix colors on my palette and also to clean up space on my palette if things start to get out of control. I think the palette knife is best used in combination with a brush. You can get some beautiful contrasting effects by using both in your paintings. However, you don't want too much contrast. 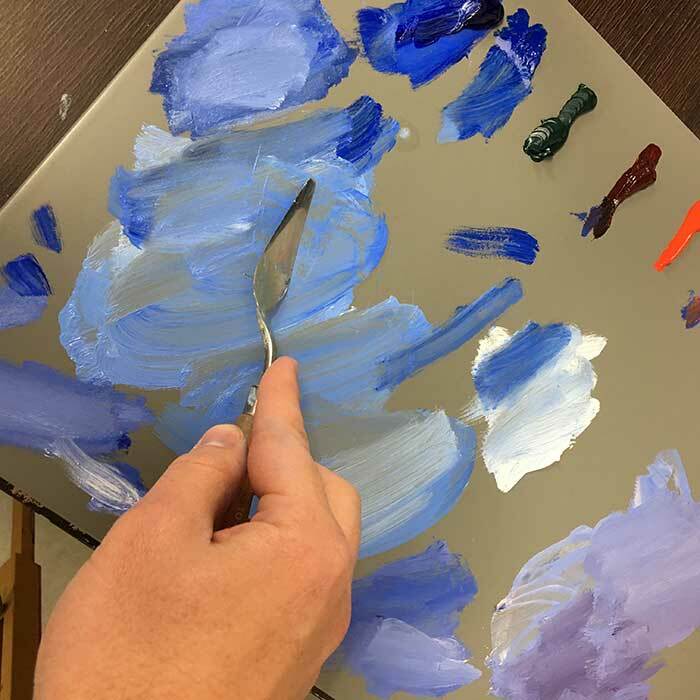 You want all the elements in your painting to work together, so make sure your palette knife work is somewhat in harmony with your brushwork. 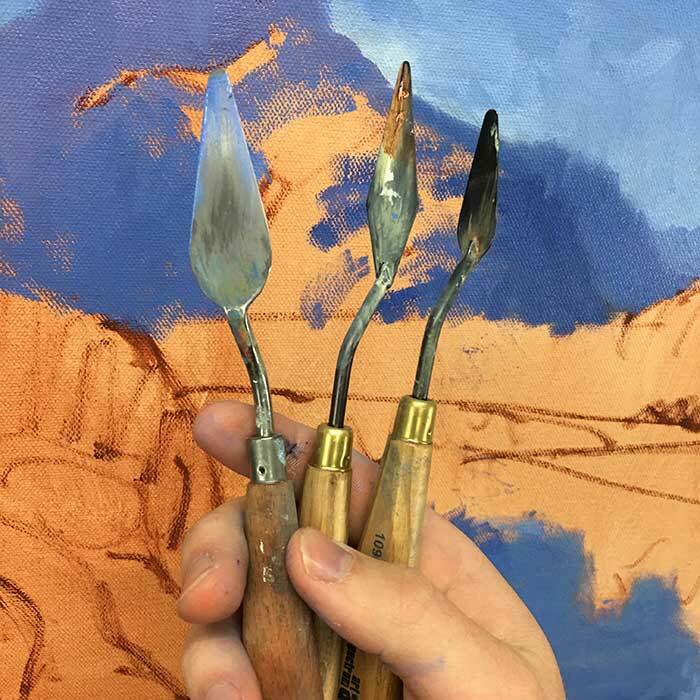 A technique I frequently use is to soften the edges of any palette knife strokes with my brush, or run my palette knife over visible brushwork. This can create a subtle connection between the palette knife work and brushwork. You should also make sure there is either a dominance on palette knife work or brushwork. You probably shouldn't use both equally throughout your painting as it may look slightly confused. If I use mostly palette knife work in my painting, I could incorporate small areas of visible brushwork to break things up. 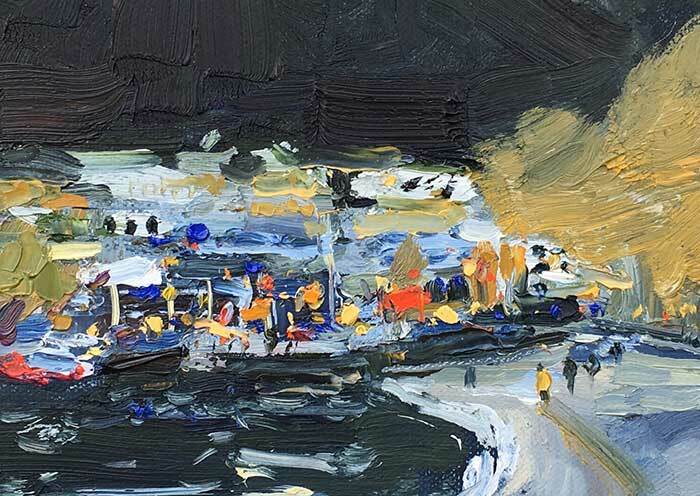 On the other hand, if I mostly use brushwork, I could break things up with small areas of thick palette knife strokes. Just remember that you need all the elements in your painting to work well together. 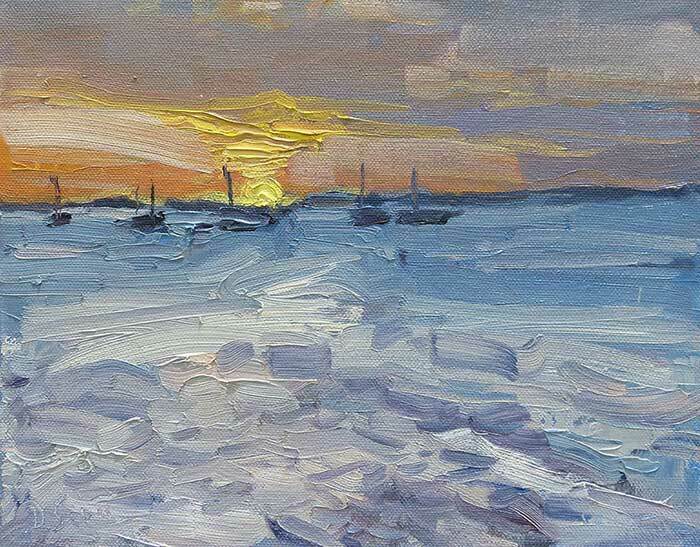 There is no point having some beautiful strokes of color in your painting from a palette knife if they do not fit with the rest of the painting. My painting below is a demonstration of both palette knife work and brushwork. I used the palette knife to build up that thick texture on the canvas, particularly for the sun. I used the brush to add some of the finer details. Make sure to clean your palette knife after you have finished. If you forget, the paint will dry and your palette knife will be almost worthless (as it will have a rough edge). You might be able to save your palette knife by scraping the dried paint away with a razer, but sometimes this is just not worth the hassle. Don't get too regular with your palette knife strokes. Try to mix things up in terms of stroke length, color or texture. You don't need all the unusual palette knife shapes. You just need a few sizes of standard-shaped palette knives. The palette knife can scrape away paint just as easily as it can apply paint. 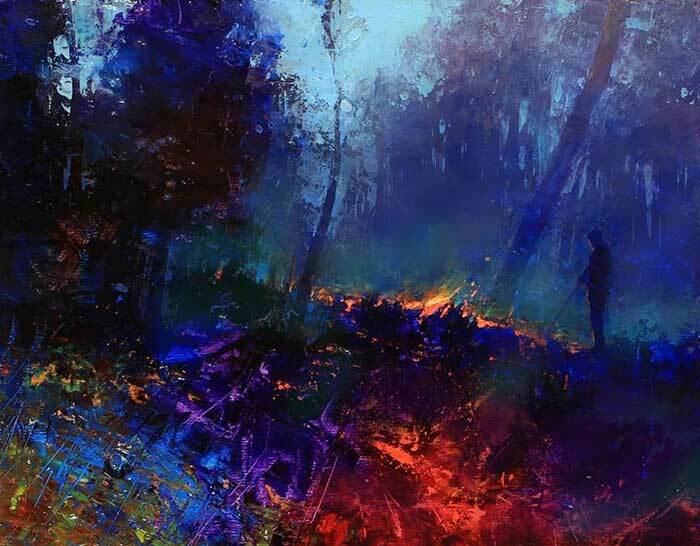 The palette knife comes at the sacrifice of accuracy and intricate brushwork, so try to make up for it with stunning use of color. The palette knife is great for sharp shifts in color. For example, if you want to indicate some sunlight peering through a dark cluster of trees, the palette knife would be great for this. Very interested and helpful tutorials for my paintings. Thanks a lot! This is was useful for me. Thanks a lot. You forgot to mention how frustrating they can be! Seriously good tips thanks! Really good overview, thanks, Dan! I started with palette knives long ago, switched to brushes after a short while, and have recently just really wanted to get back to playing with paint with palette knives again; much appreciate the links, esp to videos – thanks! I love your way of teaching. I use the palette knife a lot.